Just like the heroine of its 50th animated movie, Disney is letting its hair down and moving on. Tangled will be the studio’s last fairytale for some time and, happily, the Mouse House have pulled off their most enjoyable ’toon since 2000’s The Emperor’s New Groove. That absurdist surprise was a real standout – looking back over Disney’s century of movies, it’s alarming how suddenly the quality drops off after The Lion King. But Disney/Pixar creative director John Lasseter took Tangled back to the drawing board in 2008, re-emerging with a modern retooling of the Brothers Grimm fable Rapunzel that’s whisked with just the right mix of snappy smarts, touching emotions, dark shades and lively action. Snatched from her parents as a baby, our Princess (sassily voiced by Mandy Moore) grows up in a skyscraping tower under the watchful eye of her kidnapper/surrogate mommie dearest (Donna Murphy). The old crone uses Rapunzel’s magical, endless golden hair to stay young and beautiful, but Rapunzel’s wish to escape into the great outside world finally comes true with the help of good-hearted thief Flynn (Zachary Levi). Now wait just a minute… A strong-willed heroine longing to see outside. A dashing hero who needs to settle down. Some so-so musical numbers penned by composer Alan Menken. Is this really a whole new world? Or is it The Little Mermaid with legs and a blonde wig? But if it’s a clear repackaging of classic Mouse House formulas, Tangled does attempt to catapult itself clear of the throwback charm of last year’s The Princess And The Frog. The modern motor for this girl-power saga is its remarkably sharp grasp of mother/daughter dynamics, particularly surprising given it’s from the boys behind Bolt. Hero Flynn is cut-out-and-keep (“I don’t do backstory,” he shrugs), but Broadway star Donna Murphy's vocal performance as the vain, villainous fake-matriarch is marvellous – her belted-out rendition of ‘Mother Knows Best’ is easily the film’s top musical number. 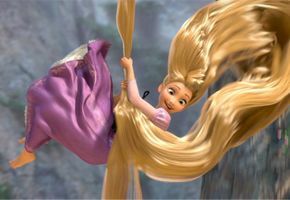 And when it comes to the vibrant, painterly visuals, everything flows from Rapunzel’s streaming golden hair. She hurls it around – a swing, a weapon, a grappling hook – for some amusing, imaginative set-pieces. Better still, the animal sidekicks are right on the money, too. A horse called Maximus who thinks he’s John McClane and an adorable chameleon called Pascal are tie-in toys you just pre-ordered in your head. True, you never quite shake the feeling Tangled was born out of team brainstorming rather than true inspiration, but the movie’s magic moment arrives when Rapunzel and Flynn’s romance comes alive: a luminous sequence in which thousands of floating lanterns light up the night sky, allowing the animators to ramp up the 3D just at the right moment. That’s the Disney we remember.